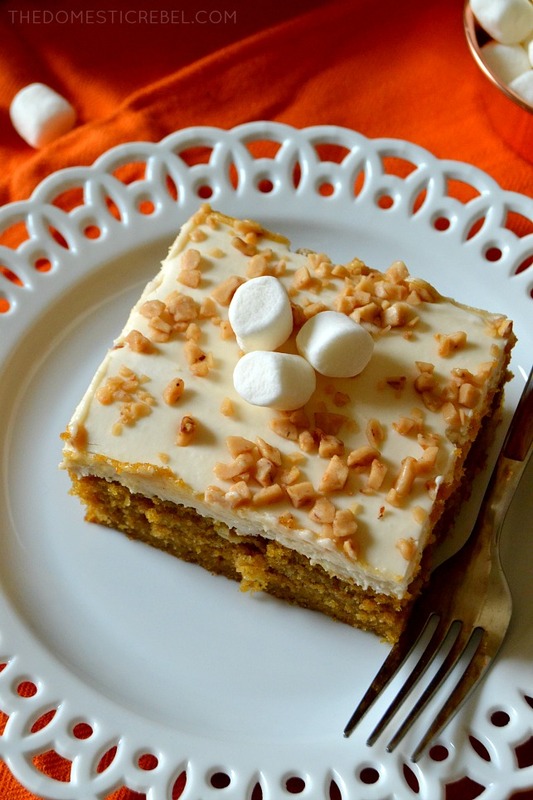 This supremely moist and tender Sweet Potato Sheet Cake has a creamy, sweet layer of thick Marshmallow Frosting and is such a fun departure from typical pumpkin desserts! Complete with crushed toffee bits on top, it’s a show-stopper for fall! So for many years, we’d go to my Grammie Pat’s house for Thanksgiving and Christmas because for many years, we lived only two doors down from her house. It was a quick walk over to her place and dinner was ready. And for a loooong time, she made sweet potatoes as a side dish but no one liked them. So they’d sit, sad and untouched at the table, only eaten by my Grammie Pat and my uncle. I wondered why she always made the effort of making a big batch, maybe holding onto a shred of hope that one year, maybe – just maybe – someone would ask for a spoonful. Well, I guess it worked on me, because one year I caved in and went whole hog on that damn casserole dish. I ate most of it and kept going back for seconds and thirds. It was so good. I don’t know why it took me forever to relent to the siren song of sweet potatoes covered in a thick, gooey layer of marshmallows, but once I took a bite, I was hooked. Then one year she decided to be sadistic and throw in pineapple. Um, sorry, granny, but get that freakin’ pineapple away from my sweet potatoes. It has no place at this table. She is kind of like a wildcard: most of the time she’s pretty predictable with her food offerings, but sometimes she’ll stir some sour cream into brownies and hand them to you and not say anything about the giant blobs of white in your brownies so you’ll take a bite thinking they’re marshmallow brownies but it’s actually brownies with pockets of hot sour cream in them. ANYWAY. 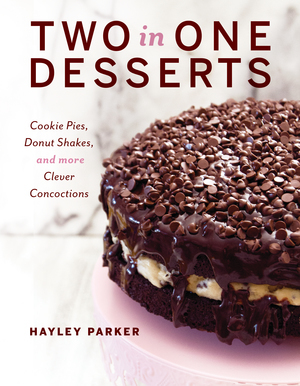 Now that I’m #TeamSweetPotato, I could not wait to think up some yummy sweet potato-inspired desserts for my blog. 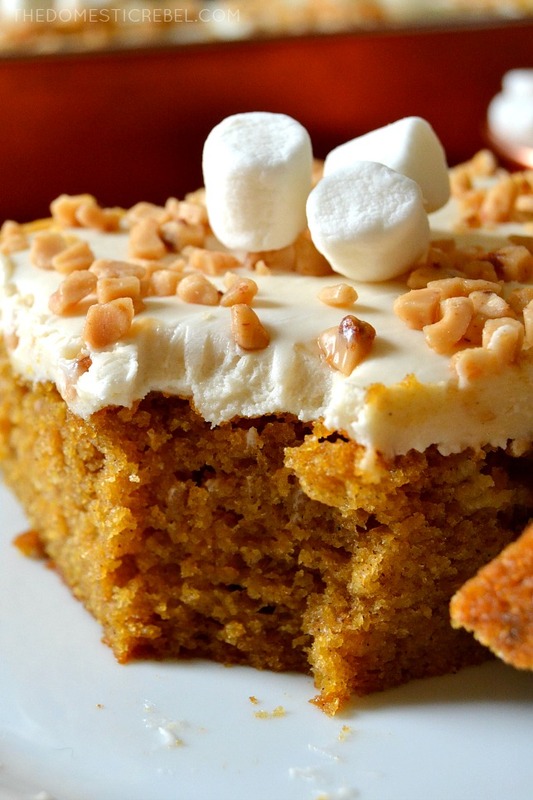 Everyone focuses on pumpkin this time of year, which is great! – but sweet potatoes are just as delicious. 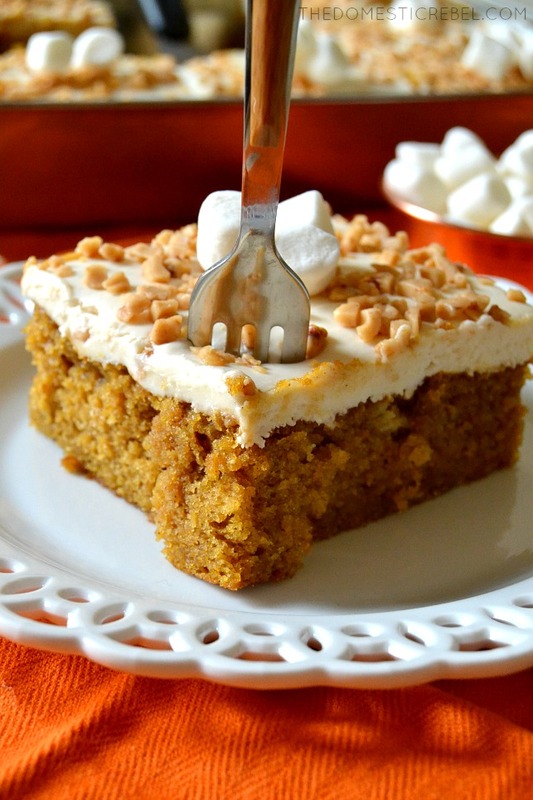 I revamped my Pumpkin Spice Sheet Cake recipe and turned it into a sweet potato vision complete with a fluffy marshmallow frosting that sends it over the top! 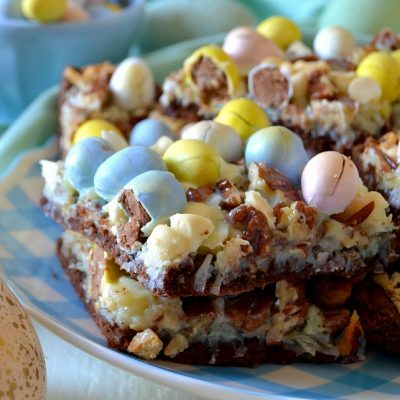 For a little crunch and texture, I sprinkled some crushed toffee bits to the top of the cake, but this would be equally fab with marshmallow bits or even finely chopped pecans! Just please, leave the pineapple far away from the sweet potato cake. 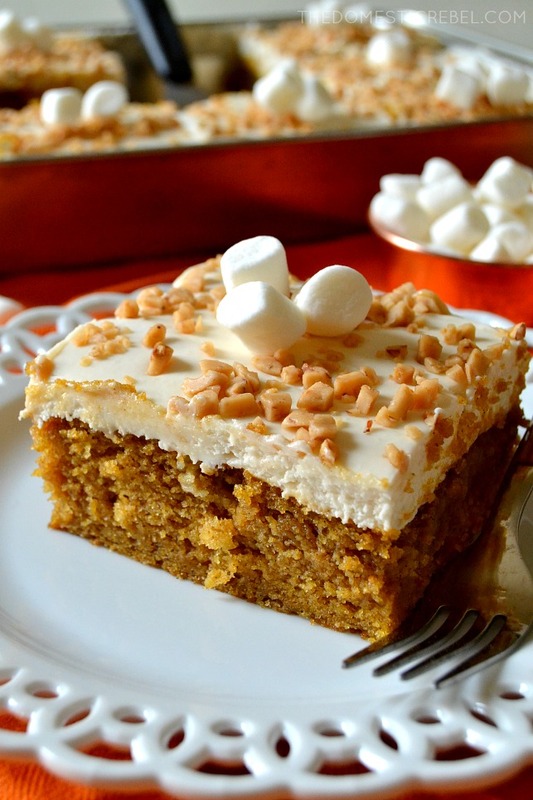 This Sweet Potato Sheet Cake is so moist, tender and flavorful with a lovely hint of spice, but the fluffy marshmallow frosting is what sends this cake over the top! Preheat oven to 350 degrees F. Liberally grease a 13x9" rectangular baking pan with cooking spray and set aside briefly. In a large bowl with an electric mixer, beat together the granulated sugar and sweet potato puree until blended. Carefully beat in the oil and vanilla, then the eggs one at a time, beating well after each addition. Meanwhile, in a separate bowl, whisk together the flour, baking powder, baking soda, spices, and salt. Gradually add in the flour mixture to the wet mixture, beating well until batter is smooth and combined. Pour the batter into the prepared pan and smooth out the top. Bake for approximately 25-30 minutes or until a toothpick inserted near the center comes out clean or with moist - not wet - crumbs. Cool completely. For the frosting: In the bowl of a stand mixer, cream together the butter and marshmallow fluff until combined, about 1 minute. Beat in the vanilla and gradually begin adding in the confectioners' sugar, about one cup at a time, until frosting is light and fluffy. If frosting is too thick, add in a little of the milk or heavy cream to thin it out. You want the frosting to be spreadable, so not too thick. 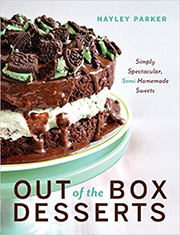 Spread the frosting onto the cooled cake in an even layer. Sprinkle with toffee bits and serve. Store leftovers either in the fridge or at room temperature, but covered either way. 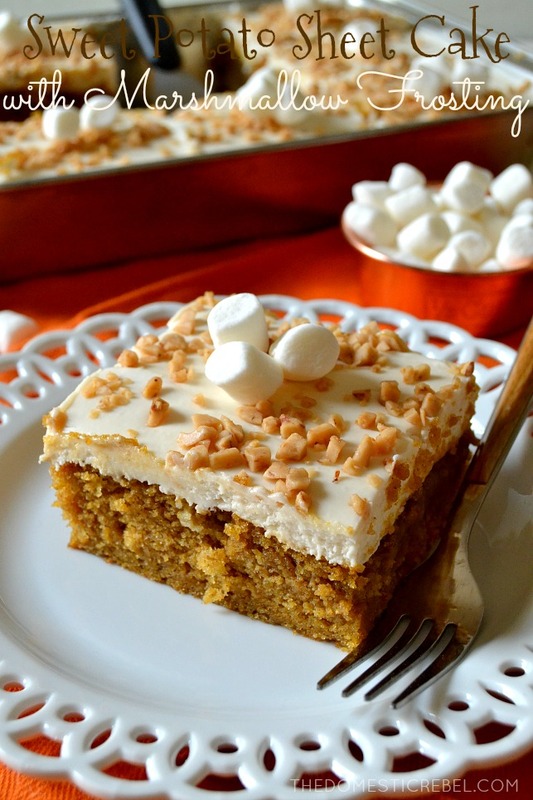 I love how moist and flavorful this sweet potato cake is! The sweet potato flavor really shines here. If you prefer things more spicy, feel free to add more spice quantities as you see fit. I mean, sweet potatoes with marshmallows are a dessert masquerading as a side dish…so thank you for making an honest dessert out of it! Could I use mashed sweet potatoes instead of canned purée?